Recently, I inflicted some of my half-baked notions about the evolution of motorcycle design upon the CityBike readership. The article (Feng Shui June '02) came about when I discovered that the Buell XB9R Firebolt's revolutionary fuel-in-frame idea had been used on the 1909 Pierce Four and further study revealed that many of the ideas we consider cutting edge have been tried before. And so it turned out that when fearless leader Halton proposed doing an issue featuring John Britten's radical racebike, for me it was a case of deja vu all over again. You see, John Britten was often quoted as saying that he liked to work from 'first principles.' But even though he preferred not to simply develop the designs of others, upon close examination it's apparent that he did just that. In many cases he put a new face on old technology. Note that I intentionally leave out the word 'merely' because Britten's V-1000 really is an inspired work and much of what was done was original, fresh, and state-of-the-art. It was the execution-the arrangement of just the right components and the use of modern materials-that made the Britten the most advanced motorcycle of its day. Most of the actual design concepts had been around for decades. John Britten's racing career began with Ducatis, however, there were reliability problems and the fact that Italy was half a world away may have prompted him to look for a solution closer to home. So he turned to a homebuilt Kiwi bike, the Denco, which was an air cooled V-twin originally intended for speedway racing, but when it proved unsuited to the rigors of roadracing, Britten set about to produce an engine of his own that would be, no surprise, a V-twin. It was an electronically fuel injected, 999cc, 60-degree V-twin employing four-valve heads carrying belt-driven cams. Innovative, certainly, but just how state-of-the-art was it? A good question, when we consider that Indian campaigned a 1000cc 8-valve V-twin in the popular board track races of 1911. And the toothed rubber belt that drives the camshafts in the Britton first saw production on OHC Pontiac straight- six engines in 1966. Meanwhile, anyone could buy an EFI equipped Volkswagen in 1969. If the Britten is derivative of any motorcycle, that honor would go to the fabled roadburners produced a half century ago by Phil Vincent. Vincent, and legendary motorcycle engineer Phil Irving, were determined to build the fastest production bike on the planet and succeeded because they realized that they couldn't beat the factories at their own game. To that end they came up with the most outstanding feature of the Vincent and, later, the Britten: they threw away the frame. Vincent's 50-degree V-twin was hugely overbuilt and utilized unit construction, at a time when its Brit counterparts routinely had separate gearboxes, so as to provide an extremely strong foundation upon which to mount all of the ancillary structures of the bike. A steel box was bolted to the cylinder heads, which provided attachment points for the front suspension and also doubled as an oil tank. A neat idea, but even the Vincent had its antecedents. The 1901 Indian single located its engine where the bicycle type frame would usually have a seat tube, making the engine a stressed member. The front was suspended with a girder fork, even though most other manufacturers were rallying behind the new telescopic items. The teles were cheaper and lighter, but their drawbacks were that they dive under braking, tend to bind up, and create undesirable geometry changes-issues that still affect forks today. So Irving refined the girders with alloy blades, modern hydraulics, and incorporated adjustable eccentrics into the suspension links. This gave the Vincent a suspension that was anti-dive, maintained a constant wheelbase, separated braking forces from bump absorption, and could be adjusted to suit the rider's needs, although the last feature was mostly to accommodate a sidecar. At the rear, a triangular swinging frame pivoted on the gearbox and was controlled by hydraulic dampers lying almost horizontally between the top of the frame and the oil tank. Oddly enough, the design was almost the company's undoing when it was introduced on Vincent singles in 1935, as rear suspension of any sort was rare; consumers viewed the newfangled idea with skepticism. Vincent was exonerated when Yamaha reprised the idea with their Monoshock scheme four decades later. Too bad the Vincent went out of production two decades earlier. Fast forward to the -90s and it's apparent that the spiritual heir to the Vincent's throne must be the Britten V-1000. All of the elements are there: a massive 60-degree V-twin engine supports a box structure atop the cylinder heads which locates a girder fork assembly and a decidedly triangular swingarm pivots directly on the gearbox. But time and technology march on and there are vast differences between the two. What must be said from the outset is that John Britten's genius stems from his ability to conceive a crystal clear vision and to distill it down to a supremely functional product. Like Vincent and Irving, Britten knew that to produce a world beater, he had to maximize power while striving for minimum weight in a package that would punch absolutely the smallest possible hole through the atmosphere. There could be no compromises. Every part had to satisfy those goals or it didn't make it onto the bike. A V-twin was the natural choice because it is the slimmest engine design available. And though it may have been tempting to follow Ducati's lead by using a 90-degree V-angle, a 60-degree angle offered a number of advantages. The engine could be more compact, which allowed it to be mounted forward for better weight distribution. The closer cylinder head spacing also facilitated mounting the suspension and seat structures, as well as easing intake and exhaust plumbing problems. The wag who quipped that an elephant is a mouse built to government specifications would have loved the Britten engine. Because it had to handle the tremendous loads fed into it by the suspension, it was truly a massive affair. Beyond simply using lots of aluminum to provide the required strength, Britten cast the upper crankcase integrally with the cylinder barrels then further added a robust stiffening web between them. This partly negated the weight saved by ditching the frame, however, the perimeter frame that would have been necessary would have added too much width, so the trade off was deemed worthwhile. Most of the engine was built in-house, with the exceptions being aYamaha close-ratio five-speed transmission driven through a Kawasaki ZXR-750 dry clutch. Titanium valves and con rods were supplied by local manufacturers and three-ring slipper pistons were purchased from Omega. Britten clearly realized you shouldn't try to reinvent the wheel in everything you do. Four valve cylinder heads used belt driven cams spinning in roller bearings. The cams operated 40mm intake and 34mm exhaust valves via shim-under-bucket design and the valves were set at a 30-degree included angle, but with the intakes closer to vertical so as to require shallower relief cuts in the piston crowns. This helped achieve a compression ratio of as high as 13.7:1. Britten could have topped his creation off with a pair of flat-slide carbs and it would have been just as powerful as it was with electronic fueling. Instead he opted for an engine management system featuring a full history facility, which allowed him to fine tune the engine with a few deft key strokes of a lap-top. The bike was first and foremost a race machine, so the ability to quickly compensate for changes in air density and humidity at the track were a boon. The capability to monitor and record the engine's running conditions were put to the test after Britten rider Mark Farmer's fatal crash at the 1994 Isle of Man TT. With so much new and unproved technology riding on the bike it was feared that mechanical failure was the cause of the accident, however, information provided by the data acquisition system at the inquest exonerated the bike. Listing specs for Britten engines is complicated because they were constantly under development and changes were the order of the day. For instance, the stroke could vary from 64mm for the 999cc models to 72mm, which gave over 1100cc of displacement. Compression ratios ran from 11.3:1 to 13.7:1, depending upon which source you're referencing and horsepower is listed as 155 @ 11,800 rpm to over 170 @ 9,500 rpm for the bigger engine. Maximum safe speed was at 12,500 rpm. Pretty healthy figures to contain within a 55-inch wheelbase weighing in at 319 pounds. It's no wonder that the Britten easily wheelied past Ducati-mounted Pascal Picotte at the '92 Daytona SuperTwins race and clocked an impressive 189 mph on the banking. But abundant power was only part of the equation. Such performance couldn't be achieved without due attention to weight saving and aerodynamics. Carbon-fiber is pretty commonplace these days, at least in the motorcycle aftermarket, where it's mostly used for fenders, key fobs, and toilet seats (no kidding, see Motorcyclist, Aug. '02, page 111), but not so a decade ago. A spin-off from the aerospace industry, the black stuff is feathery light and stronger than steel, however it's also costly as all get-out and difficult to work with. As you would imagine, just cutting the cloth is arduous. Then it has to be laid-up into a mold, vacuum bagged and autoclaved for hours. Not exactly your typical home project. But even if you manage to bring forth a fender or key fob, how would you go about making items that can serve as highly stressed, load bearing parts on a race bike? John Britten found an answer. The problem is that while carbon-fiber is immensely strong, it's also quite brittle and prone to cracking when the part in question has to bolt up to another component. Britten's solution, one he called his skin and bones method, was to machine aluminum spools to serve as hard points. Once in position, carbon/Kevlar filaments were wound around them under tension, the Kevlar supplying durability that helped offset carbon's brittle characteristics. The assembly was treated with resin and cured in the usual fashion, then the part was skinned over with carbon cloth to give a finished component of great rigidity in all planes. Britten used this method to build the front and rear suspension, their respective attachment structures and theradiator/seat support. Wheels were another matter. He could easily have used Marvics, but magnesium is awful stuff. It's expensive, doesn't take impacts well, and it corrodes easily, which makes it even more likely to crack and fail when you need it most. So Britten built his own wheels, using the bones technique for the hub and spoke areas. He then wound on carbon tape, which was machined to create the rim. Subsequent testing showed that his carbon wheels were every bit as light as mags and were better able to resist bending loads as well. Ultimately, carbon components not only saved enough weight to compensate for the engine's considerable heft, it saved weight at the ends of the bike so as to lower the polar moment of inertia. The Britten utilized mass centralization before the term became a buzz word in the industry.It also allowed him to resurrect that bygone staple of pre-war suspension technology, the girder fork. Who could have imagined you'd ever see one of those again? As Vincent and Irving realized years before, the girder has a lot going for it, but for the kinds of loads imposed by a modern race bike, a girder fork could not be made light enough while still providing the necessary stiffness using conventional materials. Carbon construction solved those problems. Moreover, Britten exhaustively developed the placement of the wishbone pivots and provided eccentric adjusters to give a wide range of possible steering geometries and whatever amount of anti-dive the rider may desire. An additional bonus was that the girder's blades could be exceptionally thin, contributing to the bike's low frontal area. And low it was, because while you can lower the coefficient of drag with a nicely shaped fairing, the Cd is only a multiplier of the frontal area. That is, a faired bike with a large frontal area may have a lower Cd than an unfaired bike, but still have higher absolute drag numbers. In fact, Britten conducted top speed runs on a country road outside of his Christchurch, New Zealand home and found that a fully faired version of the V-1000 was slower than the partially faired one. That fact prompted Britten's single-minded effort to keep the bike as slim as possible. Witness the serpentine exhaust system; made from tapered tubing, it tucked impossibly close into the chassis without giving up its equal length header geometry. It was said to require 60 to 70 hours to construct. Even more attention was given to the cooling system. We've all seen the radiators on conventional race machines; they're huge! And they have to be because the front tire and fork block their air flow and the spinning front tire makes what flow there is turbulent and therefore inefficient. Worse still, hot air exits the radiator onto the header pipes and cylinder head, which adds to their thermal load. That heat goes back into the engine's coolant, which goes back to the radiator only to be injected back into the engine...you get the picture. Oh, and did we mention that the air in the engine bay isn't especially of the low pressure variety, and so doesn't encourage air to flow through the rad in the first place? What a mess. Britten realized this and certainly wasn't about to waste the advantages he had gained with his skinny engine and fork by planting a barn door of a radiator up front. The front fender was shaped to deflect air into ducts that were molded into the upper fairing and that air was then guided to a radiator located beneath the seat. The resulting air flow was unaffected by engine heat and since it originated in the high pressure area at the front of the fairing and was ejected into the low pressure zone at the rear, the engine was happy with a radiator that had a surface area of only about 70 square inches-that's 30% less than the cover of a typical phone book. That one change also permitted Britten to mount the rear shock in the space where the radiator would customarily be mounted, maintaining a forward weight bias and keeping the shock away from heat traps. There is no question that John Britten advanced the science of motorcycle design and construction by quantum leaps, even given that some of his ideas weren't completely original. Erik Buell must have garnered some inspiration for his under-the-engine rear shock location from the Britten, and Benelli too, with the rear mounted rad on their latest WSB entry. But the sad fact remains that much of his work is just too labor intensive to make it to a production level. It's intriguing to imagine what might have been had Britten lived longer. He was reported to be working on a supermono model and perhaps a road worthy model of the twin as well. And it's not a stretch to think that a 990cc version could have been a force in the newly configured MotoGP, is it? Contemplating Britten's creation begs the question: what is the nature of genius? When you or I encounter mere intelligence we might think-if I really applied myself, I could do as well. But then you come across a work like the V-1000 and realize you're skunked. Even if I won the Lotto and devoted the rest of my days to the task, I'd never approach what John Britten wrought. That's the nature of genius. God bless Jim Hunter, the well-funded enthusiast who gave me one of the most memorable experiences of my life: racing the Britten. Hunter originally asked if I could ride the bike at Daytona during the vintage weekend preceding the AMA national, doing a few parade laps on the revolutionary bike with the booming tone. Third-gear power wheelies were no problem, and then Andrew Stroud showed the world how New Zealand makes a twin win. Stroud, at about six feet tall, seemed tailor-made for the Britten, while my height-challenged (5'8) physique was a bit of stretch for the tall twin. John Britten built his bike around a tall V-twin engine, and ran the radiator and exhaust system under the seat, putting me on my tip-toes at a standstill. That's no big deal, but what I noticed is how much lean angle it took to get my knee on the ground due to the bike's height. Hunter had asked me to race the bike and I filed several reports in Sport Rider magazine, feeling like the luckiest guy in the world. A tall chassis will wheelie more easily and the Britten definitely liked to wheelie, but due to John's innovative front-end design, the expected weight transfer during heavy braking was wonderfully controlled. A bike won't steer well without front weight transfer, but we've all ridden bikes with too-soft front springs that fall to their knees like a drunken water buffalo anytime the front brake is touched; those bikes generally want to run straight under hard braking. Because John separated weight transfer from suspension movement, he could dial in the amount of front weight transfer to load the front tire, but not bottom the suspension. I can't describe the Britten as light steering, but it offered extremely linear steering feel, meaning that your rate of turn-in was predictable even over the bumps entering and exiting Daytona's chicane. You can imagine the trepidation of a rider stepping aboard the Britten, and that trepidation was enhanced by the initial lack of traction information coming from the tires. I write initial, because as we've constantly discovered over the last decade, we riders must improve our skills as Japan, Italy and Germany improve the hardware. Due to the Britten's rigidity, especially in the front fork, the amount of traction feedback was much less than I had been experiencing on standard production bikes, and especially my TZ250. A lack of feedback prompts slow laps, and I initially depended on the point-and-shoot method of riding until Andrew Stroud helped illustrate how hard the bike can be ridden at corner entrances and exits. I could never match Stroud's pace, but every lap was an improvement. Hunter (bless him again) saw me throw his bike on the ground twice, but like all professional racers, I have a few excuses. Crashing a bike worth more than my house is memorable, and every moment is imprinted in my brain. The first time is a lesson in learning when to quit: We entered an unlimited race at Daytona and not only did I holeshot the field, I was leading the Erion Honda CBR900RR with Michael Barnes (I think) aboard. About the third lap, the Britten started wagging its tail entering the horseshoes and the chicane while under hard braking. My mind, clouded by the Red Haze of Racing, simply attributed the wagging to, well, I don't know. A lap later the steering damper, which had slipped its mount and was hitting against the exhaust header pipe, slipped further and hung up on the header, effectively locking the steering. In the chicane. At about 80 mph. Hunter hardly batted an eye, apologized for the loose damper and said, ìIt was great to see you leading all those unlimited bikes! 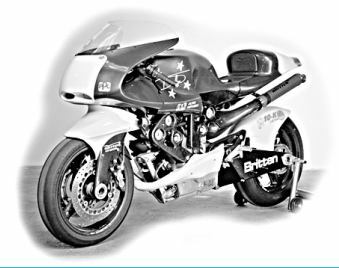 For many, this performance clearly defined the Britten, a bike that could easily demolish any other twin in the world but hadn't had much press against monsters like Erion's CBR. This thing was and is a seriously competitive race bike. The last time I rode the Britten was bittersweet, a Road Atlanta memory that fits into the category of ìif onlyî. The Britten had proven to be relatively strong and dependable, with the exception of the electronics. The gremlins reared their heads at Road Atlanta, and the bike only ran well for two practices of the Formula USA weekend. Despite my relative inefficiency at Road Atlanta, the Britten got me around the track within two-tenths of a second of David Sadowski's quick times. The bike ran poorly during qualifying so I was gridded about mid-pack, but Hunter and I felt a quiet confidence. Sunday morning dawned, and the bike wouldn't fire. Hunter and I were on the low side of a very steep learning curve and we continually tried different maps on his lap top while the rest of the field completed morning practice. About three minutes before the race's warm-up lap, the Britten came to life as I scrambled into my leathers. Anyone who knows the characteristics of Michelin's last-generation of slicks can predict what happened next because I went out on brand-new Michies without the benefit of tire warmers. Why plug in the tire warmers when the bike won't even run? Why must all lessons be so expensive? I tossed it in turn three after a mediocre start. The lack of traction feedback contributed to my highside, but it was my eagerness to put this bike up front that is ultimately to blame. I wanted to prove John's engineering theories to the world, pay back Jim Hunter and win a nationally televised roadrace on a bike many thought to be a simple show piece. In the end, I'm left with as many questions about the Britten as answers. I have enormous respect for the Japanese engineers who bring us R1s, GSX-Rs, etc., but wonder what holds them so solidly to the conventional path. One can't argue with the success of alloy perimeter frames and inverted forks, but John Britten's world-leading work could certainly be experimented with in Grand Prix racing where production bikes and parts are prohibited. Ron Haslam rode the Elf-backed Honda NSR500 with a swingarm front end, Bimota produced the Tesi, and James Parker convinced Yamaha to build the RADD Yamaha GTS street bike, but like the Britten, these technological ground-breakers have been swallowed up by spin-offs of perimeter frames and hydraulic forks. I have always wondered how the Elf Honda would have done with Eddie Lawson on board. Likewise, I wonder how the Britten would have done in the Road Atlanta F-USA with Andrew Stroud at the controls. My main message in all these words is that the Britten was the real deal, proving that true genius emanates from backyards as well as high-dollar design centers.